There’s more to a GPS vehicle tracking device than just showing the location and travel route, now these multi-functional devices provide important safety features to protect your vehicle from theft and possible loss. One safety feature that can reduce theft and call for help in the event of an emergency is the panic button that is available on various vehicle GPS tracking devices. 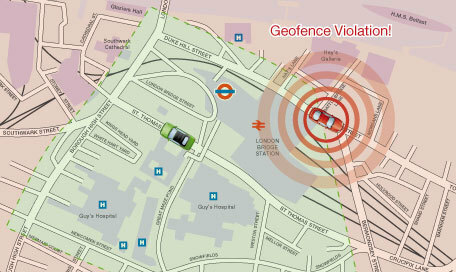 Panic buttons can work in either manual mode by being activated by the vehicle driver in the event of an possible carjacking or road emergency, or can be operated automatically by establishing an ‘electronic’ fence (geofence) that will send a report if the vehicle leaves the specified geofence zone. A second safety feature that is available on GPS tracking devices is radio frequency ID (RFID) which will stop unauthorised people from starting and driving your vehicle. RFID works by requiring that the driver have the necessary identification before the vehicle can be started or driven and utilises a small microchip that is embedded in an ID card, key chain or other similar device that will transmit an identifiable signal that the driver is authorised to use the vehicle. A third feature that is available on vehicle GPS tracking devices allows remote communication with the GPS devices allowing you to disable the vehicle and activate an alarm for any unauthorised vehicle activity. Using SMS commands you can activate the vehicle alarm system and gives an audible alarm and shuts down the vehicle fuel system, or ignition reducing the chance of theft. GPS tracking devices a no longer just for vehicle location tracking, now these high tech devices provide important safety features to reduce vehicle theft, stop unauthorised use and send a call for help in the event of an emergency.